The outcome of this war will most likely be decided on the Western Front, where the bulk of German and Allied forces are deployed. But there are other fields of battle, and one of these is East Africa, where Lettow-Vorbeck has commanded German forces since the beginning of the war. His plan remains to keep his army in being, tying down as many Allied troops as possible and preventing their transfer to Europe. The forces ranged against him are overwhelming but Lettow-Vorbeck remains at large, his army (European officers and locally recruited Askaris) continuing to evade resist Germany’s enemies. 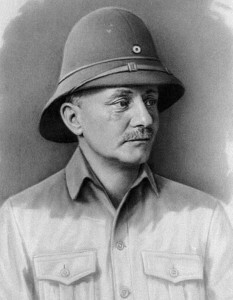 Lettow-Vorbeck has been unable to prevent the Allies from overrunning German East Africa. He has retreated into the Portuguese colony of Mozambique where his army is living off the land, often leaving starvation in its wake but also provoking native rebellions against their colonial masters. British Empire forces under South Africa’s Deventer and Portuguese army units seem powerless to stop Lettow-Vorbeck’s march; Deventer in particular is increasingly disdainful of the efforts of his Portuguese allies. He sees their troops as next to useless, an actual liability in combat against the Germans. Fighting over the last few days at Nhamacurra, near the port of Quelimane, both accords with and runs counter to Deventer’s poor opinion of his allies. When Lettow-Vorbeck attacked the Portuguese here many of them quickly surrendered. However others, supported by a contingent of British Askaris, put up a stout resistance until they were eventually overwhelmed. The vicotry at Nhamacurra is a godsend to Lettow-Vorbeck. As well as continuing to burnish his reputation for invincibility, his men have also captured the supplies of their enemies: stores of arms and ammunition and an enormous quantity of both food and quinine, the drug that protects his European officers from the ravages of malaria. The Germans also discover a large quantity of Portuguese wine and other alcohol, which leads to what Lettow-Vorbeck describes as “a wholesale jollification”, a surrender to drunkenness enjoyed by both his African and European troops. Germany has sent the L-59 Zeppelin on a mission from Bulgaria to German East Africa, to bring desperately needed supplies to Lettow-Vorbeck‘s embattled army. After crossing the Mediterranean the airship has flown south through British occupied Egypt. To avoid interception by British aircraft, it flies at maximum speed and zig zags along the Nile to throw pursuers off course. The L-59 manages to avoid the British but the Afrika-Schiff cannot evade the elements. The cold desert nights freeze the crewmen but they also cool the hydrogen gas that keeps the L-59 aloft. In turbulent air this morning the Zeppelin nearly crashes but the crew manage to keep her in flight. Then by day the terrible heat of the Sahara wreaks its toil on the crew, making it difficult for them to concentrate or work, in some cases even leading to hallucinations. But the airship flies on, crossing from Egypt proper to the Anglo-Egyptian Sudan. The L 59 is now more than half way on its journey but then it receives an unexpected message by wireless. The British have captured the intended landing site of the L-59 in German East Africa, forcing Lettow-Vorbeck’s men to retreat into the mountains. A Zeppelin landing there would be impossible. The L 59 is ordered to return to Bulgaria. 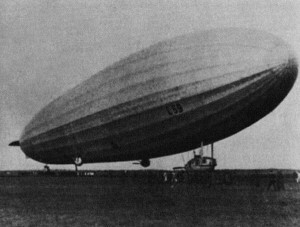 The Zeppelin’s volunteer crew beg their commander to continue the mission: they want the L 59 to fly on to crash land in the mountains, so that Lettow-Vorbeck will receive at least some of the supplies. Any of the crew who survive the crash-landing will also be able to join Lettow-Vorbeck’s army. But Captain Ludwig Bockholt is adamant that orders must be obeyed. The L 59 turns about and begins to retrace its steps. German possessions in Africa have been overrun by the Allies. The one exception is in German East Africa, where German forces under Lettow-Vorbeck continue to resist. Lettow-Vorbeck’s men are desperately short of medicine, ammunition and spare parts for their military equipment. British sea power makes it impossible for Germany to supply Lettow-Vorbeck by sea. But this is the 20th century and there are now other means of travel. Germany decides to send a Zeppelin on a mission to resupply their East African forces. 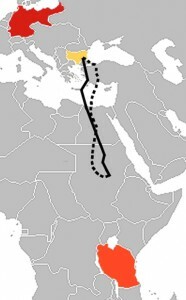 Today the L-59 departs from Bulgaria on the 5,500 kilometres journey to German East Africa. This will be a one way trip as the Germans in East Africa have no hydrogen to resupply the airship. The Zeppelin’s crew, all volunteers, will join Lettow-Vorbeck’s army and the L-59 itself is to be cannibalised for military equipment. As well as medical and military supplies, the L-59 carries Iron Cross decorations. The mission is a dangerous one. The L-59, now nicknamed das Afrika-Schiff, will be travelling across British controlled territory. And no Zeppelin has ever made such a long trip without refuelling. 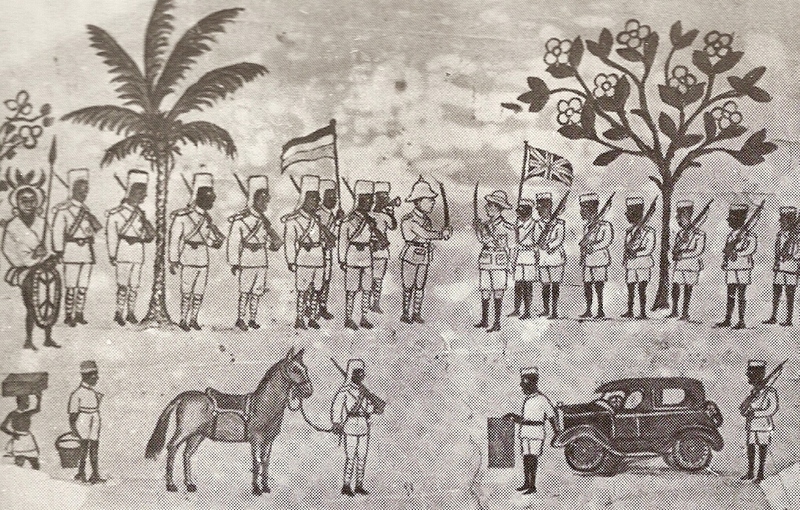 In German East Africa the British are frustrated by the continued resistance of Lettow-Vorbeck‘s army. The Germans are completely cut off from their homeland and have been driven into the interior of the colony but are nevertheless refusing to give up the fight. The campaign is becoming a game of cat and mouse, as the British hope to catch and annihilate Lettow-Vorbeck’s force while the German commander struggles to fight on. For the last few days the two sides have been fighting at Mahiwa in the south of the country. British Nigerian troops have attempted to block the Germans’ withdrawal but have found themselves surrounded by the enemy. The engagement turns into the largest battle seen yet in the campaign, with large numbers of British forces and the bulk of Lettow-Vorbeck’s men deployed into a desperate struggle by both sides to gain a decisive advantage. Today the battle draws to a close. The British have failed to block Lettow-Vorbeck’s withdrawal and have suffered horrendous casualties: something like 2,700 out of the 4,900 men deployed. However for the Germans too the situation has been a disaster. Their casualties are just 500 men or so, but this represents a significant proportion of Lettow-Vorbeck’s forces. Worse, in the fighting the Germans have used up most of their ammunition in the fighting; with modern smokeless ammunition almost completely depleted they are now reliant on obsolete rifles firing black powder rounds. The Germans have also had to abandon machine guns and face a surge in desertions from their African troops. For all that, the Germans have escaped annihilation. Lettow-Vorbeck’s war continues.